Permanent revolution. No, not Marxist theory but simultaneously the PC's greatest strength and most infuriating characteristic. Buy a new video card today and you can guarantee something faster and shinier will come along inside six months and elbow it aside. Which is why I'm always on the look out for PC-related clobber with a bit more staying power. Monitors are a good example and I've covered that angle before. Even better, I'd wager, are CPU coolers. In truth, the related subjects of cooling and overclocking have never been terribly close to my heart. I couldn't care less, for instance, about adolescent, liquid nitrogen-fuelled record breaking. Despite all that, a decent cooler is definitely an investment that delivers for the long run. And the scale of that investment is genuinely modest. Sure, you can spend hundreds. But coolers in the range of £30 to £60 cover an awful lot of bases and in value for money terms, thing drop off rapidly after that. The core benefits are twofold. Do nothing but bolt on a new cooler and you'll get lower running temperatures. That mean less stress on your CPU and motherboard and therefore a more stable system and one that will perform better for longer. Lower temps also mean lower fan speeds and less noise. Of course, if you've got reduced temperatures that means more option in terms of clockspeeds. Admittedly, Intel CPUs are increasingly locked down when it comes to clockspeeds. But if you do have a 'K' Series or Extreme model, or one of AMD's unlock CPU models, even a modest cooler upgrade will allow you to crank up the clocks significantly without running on the ragged edge. For the record, £35 quid is enough to buy you a really great air cooler like Enermax's ETS-T40. It's compatible with very current Intel an AMD CPU socket and it's all the cooler most people will ever need. If that's not a huge surprise, did you know that pukka water cooling kits can be had for £60? I'm not talking about some kind of shonky, home brew, Heath Robinson mess of leaky tubes, clips and pumps. Nope, your £60 buys a fully closed-loop system that never needs topping or any assembly other that mounting the cooling block to the CPU, just like an air cooler. 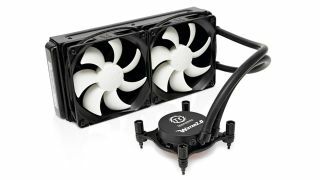 Something like Thermaltake's Water 2.0 Performer. The result is dramatically lower operating temperatures and very, very low noise levels. What you won't get with water is a major boost in overclocking headroom compared with a decent air cooler. But I still think the added reliability and peace of mind that comes with a water cooler is worth the extra money. As a final aside, what about passive air cooling? There are a number of air coolers designed to get the job done courtesy of nothing but a mahoosive array of copper cooling fins. The benefit is zero noise and much less dust build up. There's no doubt that spinning fans encourage the accumulation of nasty, smelly dust over time. But the reality is that passive cooling isn't suitable for high performance PCs. It's just not good enough at controlling temps. So do your PC a favour if you haven't already and give it a cooling upgrade. Odds are, you'll be able to carry over whatever cooler you buy when you replace the CPU or even build or buy an entirely new rig. It's one of a small handful of truly long lasting acquisitions you can make for your PC.